The Duanwu festival (or the Dragon Boat festival ) is tomorrow, but in Jimei ,Xiamen , the Xiamen dragon Boat Races was already taken May 23,the dragon boat teams from Guangdong province brought home the two cups in Men and Women competitions. 70 teams from the United States, Guam, Malaysia, Hongkong, Taiwan, and the Chinese mainland participated in the races. They were divided into men’s group and women’s group and then divided into different groups: the middle school students' group, the university students' group, and social group. This year is the first year that China puts The Duanwu festival as public holiday to celebrate Chinese traditional festival. There would be more travellers to Xiamen and Xiamen hotels compared with that of last year. The Duanwu Festival (in Mandarin Chinese pronunciation) or Tuen Ng Festival (in Cantonese Chinese pronunciation) is a Chinese traditional and statutory holiday. It is a public holiday in mainland China and Taiwan, where it is called the "Duanwu Jie" and a public holiday in Hong Kong and Macau, where it is called the "Tuen Ng Jit". In English it is also referred to as "Dragon Boat Festival", after one of the traditional activities for the holiday. The Duanwu Festival occurs on the fifth day of the fifth month of the Chinese calendar, giving rise to the alternative name of Double Fifth . In 2009, this falls on May 28. The focus of the celebrations includes eating zongzi, which are large rice wraps, drinking realgar wine, and racing dragon boats. The Duanwu Festival is believed to have originated in ancient China. The most widely known legend relates to the death by suicide of Qu Yuan, a scholar and minister to the King of Chu, in 278 BC an era in Chinese history that is referred to as the Warring States period. Scholars wrote literary works, including poetry. Qu Yuan is commonly referred to as a "poet" and a "statesperson", however he is more properly considered as a ministerial scholar. A descendant of the Chu royal house, Qu served in high offices. However, when the king decided to ally with the increasingly powerful state of Qin, Qu was banished for opposing the alliance. Qu Yuan was accused of treason. During his exile, Qu Yuan wrote a great deal of poetry, for which he is now remembered. Twenty-eight years later, Qin conquered the Chu capital. In despair, Qu Yuan committed suicide by drowning himself in the Miluo River on the fifth day of the fifth month. It is said that the local people, who admired him, threw food into the river to feed the fish so that they would not eat Qu Yuan's body. This is said to be the origin of zongzi. The local people were also said to have paddled out on boats, either to scare the fish away or to retrieve his body. This is said to be the origin of dragon boat racing. Our Magic Haijing Blog unseen for few days, this Xiamen Hotel blog is experiencing some internet access difficulty . So simple text posts here to make it colorful . Xiamen is getting hotter these days , compared with last year , it is cooler. More raining makes the temperature down and the surrounding greener. This tiny heaven- blessed seaside town is almost one of the most , if not the most relaxed in China. The best job in the world has been the hottest topic in the world, I would have been the jealous guy as any other person in this globe. Anyway , Might be in the very near future Xiamen could have one Dream Job open up for people like you and me . Xiamen has plenty of fresh air, beach, historical architecture and culture , friendly people (probably the best in the world) , you never know how lucky you are .. . The winner of 'the best job in the world' has revealed that his friends are jealous of his once-in-a-lifetime opportunity and that the selection process was like hit TV show The Apprentice. Ben Southall - who touched back down in the UK on Wednesday - beat 34,000 rivals from 200 countries to be crowned caretaker of Hamilton Island on Australia's Great Barrier Reef in a contest organised by Tourism Queensland. The 34-year-old, who takes up his post on July 1, will be paid £74,000 for just six months and duties include swimming, exploring, feeding the fish and cleaning the pool at a three-bedroom luxury villa. He will be accompanied by 21-year-old Canadian girlfriend Breanna Watkins. And he also explained how the selection process could be compared to TV show The Apprentice. He said: 'It is a real job interview. It was something that when I got out there, I didn't realise quite how similar it was to sitting down in front of a panel and actually discussing why you're good for the job. The job description requires Ben 'to explore the islands of the Great Barrier Reef, swim, snorkel, make friends with the locals and generally enjoy the tropical Queensland climate and lifestyle'. But, he says, it won't all be relaxation. 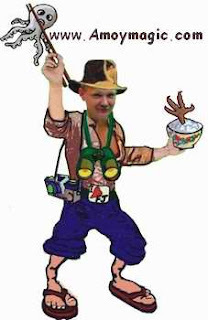 Ben explained: 'I'm acting as this ambassador for Queensland so there's going to be me and my girlfriend heading off to some of the really good attractions that Queensland has got to offer and they are dotted far and wide. 'If I'm not travelling there or experiencing it, I'm going to be sitting at home trying to be as imaginative and creative as possible with my blogging, photos and videos to really try and sell this whole area to the rest of the world. Xiamen Hotels enjoy a moment of highlight, as the opening of Straits Forum again arises a hot national topic in Xiamen . Most of the high end Xiamen hotels are running busy these days for such unexpected business . Millennium Harbourview Hotel Xiamen is not an exception, guests from Taiwan will pack this Xiamen Hotel , and mark a special day for it. More than 8,000 Taiwanese people are to attend the first civil forum between the Chinese mainland and Taiwan later this week, Yang Yi, spokesman for the State Council's Taiwan Affairs Office, told reporters Wednesday. The forum will run from May 15 to 22 in Xiamen, Fuzhou, Quanzhou and Putian in the southeast province of Fujian. The 8,000 are to include Chu Li-luan, vice chairman of the Kuomintang Party, mayors and representatives from 25 of Taiwan's cities and counties, heads of key trade organizations and representatives of more than 20 industries on the island, Yang said. They are to be joined by the mainland's top political advisor Jia Qinglin, senior civil servants, and experts and scholars from the mainland, he said. Some mainland cities would send delegations. It consists of 18 activities, including a conference on cross-Straits tourism, a trade fair, films and a symposium featuring presidents from universities on both sides of the Taiwan Strait. Issues like the economy and trade, culture, education, women and youth are to be covered. Wenchuan quake measured at 8.0 magnitude occurred at 14:28 on May 12, 2008 in Sichuan province of China and death toll exceed 80,000. 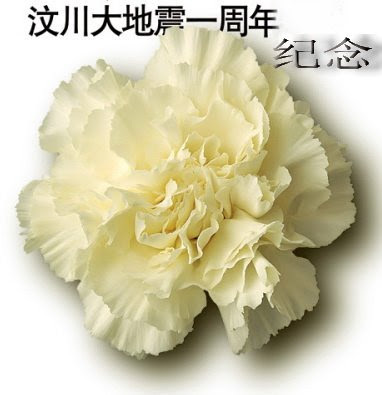 Today is the anniversary of the sad day of Chinese people , even the whole human being . I can clearly remember the love and aid coming from every corner of the earth when the disaster hit . Millennuim Harbourview Hotel Xiamen takes special action to donate all the admission fee and charity occured from Harbourview Cup Golf Tournament few days ago , totally 20783 RMB. All these amounts will go to help the reconstruction of the disaster area. Google's co-ofunder's letter of 2008, check it out ! This letter was tweeted byGillian Muessig,President, SEOmoz, who made the opening lecture of Searching note on latest SMX ( Searching engine Marketing Expo Xiamen , China) . If you want ot know the past , preaent , and future of searching engine , read it ! It seems every year Google co-founder would give a letter to public of what's happening in this internet world . Just read it! Every year our founders take turns writing a letter that is included in our annual report. We originally published the 2008 Founders' Letter on our Investor Relations site. Since today is the annual Stockholders' Meeting at our Mountain View headquarters, we wanted to make it more widely available. We welcome you to have a read, and you can also check out the webcast of the Stockholders' Meeting, beginning at 2 p.m. PT today. – Ed. Since 2004, when Google began to have annual reports, Larry and I have taken turns writing an annual letter. I never imagined I would be writing one in the midst of an economic crisis unlike any we have seen in decades. As I write this, search queries are reflecting economic hardship, the major market indexes are one half of what they were less than 18 months ago, and unemployment is at record levels. Nonetheless, I am optimistic about the future, because I believe scarcity breeds clarity: it focuses minds, forcing people to think creatively and rise to the challenge. While much smaller in scale than today's global collapse, the dot-com bust of 2000-2002 pushed Google and others in the industry to take some tough decisions — and we all emerged stronger as a result. This new crisis punctuates the end of our first decade as a company, a decade that has brought great change to Google, the web and the Internet as a whole. As I reflect on this short time period, our accomplishments and our shortcomings, I am very excited about what the next ten years may bring. But let me start a little farther back — in 1990, the very first web page was created at http://info.cern.ch/. By late 1992, there were only 26 websites in the world so there was not much need for a search engine. When NCSA Mosaic (the first widely used web browser) came out in 1993, every new website that was created would get posted to its "What's New" page at a rate of about one a day: http://www.dejavu.org/prep_whatsnew.htm. Just five years later, in 1998, web pages numbered in the tens of millions, and search became crucial. At this point, Google was a small research project at Stanford; later that year it became a tiny startup. The search index sat on a small number of disk drives enclosed within Lego-like blocks. Perhaps a few thousand people, mostly academics, used the service. Fast-forward to today, the changes in scale are striking. The web itself has grown by about a factor of 10,000, as has our search index. The number of people who use Google's services every day is now in the hundreds of millions. More importantly, billions of people now have access to the Internet via computers and mobile phones. Like many other web companies, the vast majority of our services are available worldwide and free to users because they are supported by ads. So a child in an Internet cafe in a developing nation can use the same online tools as the wealthiest person in the world. I am proud of the small role Google has played in the democratization of information, but there is much more left to do. Search remains at the very core of what we do at Google, just as it has been from our earliest days. As the scale has changed dramatically over the years, the presentation and quality of our search results have also undergone many changes since 1998. In the past year alone we have made 359 changes to our web search — nearly one per day. Some are not easy to spot, such as changes in ranking based on personalization (launched broadly in 2005) but they are important in getting the most relevant search results. Others are very easy to see and improve search efficiency in a very clear way, such as spelling correction, annotations, and suggestions. While I am proud of what has been accomplished in search over the past decade, there are important areas in which I wish we had made more progress. Perfect search requires human-level artificial intelligence, which many of us believe is still quite distant. However, I think it will soon be possible to have a search engine that "understands" more of the queries and documents than we do today. Others claim to have accomplished this, and Google's systems have more smarts behind the curtains than may be apparent from the outside, but the field as a whole is still shy of where I would have expected it to be. Part of the reason is the dramatic growth of the web — for any particular query, it is likely there are many documents on the topic using the exact same vocabulary. And as the web grows, so does the breadth and depth of the curiosity of those searching. I expect our search engine to become much "smarter" in the coming decade. So too will the interfaces by which users look for and receive information. While many things have changed, the basic structure of Google search results today is fairly similar to how it was ten years ago. This is partly because of the benefits of simplicity; in fact, the Google homepage has become increasingly simple over the years: http://blogoscoped.com/archive/2006-04-21-n63.html. But we are starting to see more significant changes in search interfaces. Today you can search from your cell phone by just speaking into it and Google Reader can suggest interesting blogs without any query at all. It is my expectation that in the next decade our searches and results will look very different than they do today. One of the most striking changes that has happened in the past few years is that search results are no longer just web pages. They include images, videos, books, maps, and more. From the outset, we realized that to have comprehensive search we would have to venture beyond web pages. In 2001, we launched Google Image Search and via Google Groups we made available and searchable the most comprehensive archive of Usenet postings ever assembled (800 million messages dating back to 1981). Just this past fall we expanded Image Search to include the LIFE Magazine photo archive. This is a collection of 10 million photos, more than 95 percent of which have never been seen before, and includes historical pictures such as the Skylab space station orbiting above Earth and Neil Armstrong landing on the moon. Integrating images into search remains a challenge, primarily because we are so reliant on the surrounding text to gauge a picture's relevance. In the future, using enhanced computer vision technology, we hope to be able to understand what's depicted in the image itself. Video is often thought of as an entertainment medium, but it is also a very important source of high-quality information. Some queries seem like natural choices to show video results, such as for sports and travel destinations. Yet videos are also great resources for topics such as computer hardware and software (I bought my last RAID based on a video review), scientific experiments, and education such as courses on quantum mechanics. Google Video was first launched in 2005 as a search service for television content because TV close-captioning made search possible and user-generated video had yet to take off. But it subsequently evolved to a site where individuals and corporations alike could post their own videos. Today Google Video searches many different video hosting sites, the largest of which is YouTube, which we acquired in 2006. Every minute, 15 hours worth of video are uploaded to YouTube — the equivalent of 86,000 new full length movies every week. YouTube channels now include world leaders (the President of the United States and prime ministers of Japan, the UK and Australia), royalty (the Queen of England and Queen Rania of Jordan), religious leaders (the Pope), and those seeking free expression (when Venezuelan broadcaster El Observador was shut down by the government, it started broadcasting on YouTube). When it began, online video was associated with small fuzzy images. Today, many of our uploads are in HD quality (720 rows and greater) and can be streamed to computers, televisions, and mobile phones with increasing fidelity (thanks to improvements in video compression). In the future, vast libraries of movie-theater-quality video (4000+ columns) will be available instantly on any device. Books are one of the greatest sources of information in the world and from the earliest days of Google we hoped to eventually incorporate them into our search corpus. Within a couple of years, Larry was experimenting with digitizing books using a jury-rigged contraption in our office. By 2003, we launched Google Print, now called Google Book Search. Today, we are able to search the full text of almost 10 million books. Moreover, in October we reached a landmark agreement with a broad class of authors and publishers, including the Authors' Guild and the Association of American Publishers. If approved by the Court, this deal will make millions of in-copyright, out-of-print books available for U.S. readers to search, preview, and buy online — something that has been simply unavailable to date. Many of these books are difficult, if not impossible, to find because they are not sold through bookstores or held on most library shelves; yet they make up the vast majority of books in existence. The agreement also provides other important public benefits, including increased access to users with disabilities, the creation of a non-profit registry to help others license these books, the creation of a corpus to promote basic research, and free access to full texts at a kiosk in every public library in the United States. While digitizing all the world's books is an ambitious project, digitizing the world is even more challenging. Beginning with our acquisition of Keyhole (the basis of Google Earth) in October 2004, it has been our goal to provide high-quality information for geographic needs. By offering both Google Earth and Google Maps, we aim to provide a comprehensive world model encompassing all geographic information including imagery, topography, road, buildings, and annotations. Today we stitch together images from satellites, airplanes, cars, and user uploads, as well as collect important data, such as roads, from numerous different sources including governments, companies, and directly from users. After the launch of Google Map Maker in Pakistan, users mapped 25,000 kilometers of uncharted road in just two months. We always believed that we could have an advertising system that would add value not only to our bottom line but also to the quality of our search result pages. Rather than relying on distracting flashy ads, we developed relevant, clearly marked text-based ads above and to the right of our search results. After a number of early experiments, the first self-service system known as AdWords launched in 2000 starting with 350 advertisers. While these ads yielded small amounts of money compared to banner ads at the time, as the dot-com bubble burst, this system became our life preserver. As we syndicated it to EarthLink and then AOL, it became an important source of revenue for other companies as well. Today, AdWords has grown beyond just being a feature of Google. It is a vast ecosystem that provides valuable traffic and leads to hundreds of thousands of businesses: indeed in many ways it has helped democratize access to advertising, by creating an open marketplace where small business and start-ups can compete with well-established, well-funded companies. AdWords is also an important source of revenue for websites that create the content that we all search. Last year, AdSense (our publisher-facing program) generated more than $5 billion dollars of revenue for our many publishing partners. Also in the last year we ventured further into other advertising formats with the acquisition of DoubleClick. This may seem at odds with the value we place on relevant text-based ads. However, we have found that richer ad formats have their place such as video ads within YouTube and dynamic ads on game websites. In fact, we also now serve video ads on television with our AdSense for TV product. Our goal is to match advertisers and publishers using the formats and mediums most appropriate to their goals and audience. Despite the progress in our advertising systems and the growth of our base of advertisers, I believe there are significant improvements still to be made. While our ad system has powerful features, it is also complex, and can confuse many small and local advertisers whose products and services could be very useful to our users. Furthermore, the presentation formats of our advertisements are not the optimal way to peruse through large numbers of products. In the next decade, I hope we can more effectively incorporate commercial offerings from the tens of millions of businesses worldwide and present them to consumers when and where they are most useful. Within a couple of years of our founding, a number of colleagues and I were starting to hit the limitations of our traditional email clients. Our mailboxes were too big for them to handle speedily and reliably. It was challenging or impossible to have email available and synchronized when switching between different computers and platforms. Furthermore, email access required VPN (virtual private networks) so everyone was always VPN'ing, thereby creating extra security risks. Searching mail was slow, awkward, and cumbersome. By the end of 2001 we had a prototype of Gmail that was used internally. Like several existing services at the time, it was web-based. But unlike those services it was designed for power users with high volumes of email. While our initial focus was on internal usage, it soon became clear we had something of value for the whole world. When Gmail was launched externally, in 2004, other top webmail sites offered 2MB and 4MB mailboxes, less than the size of a single attachment I might find in a message today. Gmail offered 1 Gigabyte at launch, included full-text search, and a host of other features not previously found in webmail. Since then Gmail has continued to push the envelope of email systems, including functionality such as instant messaging, video-conferencing, and offline access (launched in Gmail Labs this past January). Today some Googlers have more than 25 gigabytes of email going back nearly 10 years that they can search through in seconds. By the time you read this, you should be able to receive emails written in French and read them in English. The benefits of web-based services, also known as cloud computing, are clear. There is no installation. All data is stored safely in a data center (no worries if your hard drive crashes). It can be accessed anytime, anywhere there is a working web browser and Internet connection (and sometimes even if there is not one — see below). Perhaps even more importantly, new forms of communication and collaboration become possible. I am writing this letter using Google Docs. There are several other people helping me edit it simultaneously. Moments ago I stepped away and worked on it on a laptop. Without having to hit save or manage any synchronization all the changes appeared in seconds on the desktop that I am back to using now. In fact, today I have worked on this document using three different operating systems and two different web browsers, all without any special software or complex logistics. In addition to Gmail and Google Docs, the Google Apps suite of products now includes Spreadsheets, Calendar, Sites, and more. It is also now available to companies, universities, and other organizations. In fact, more than 1 million organizations use Google Apps today, including Genentech, the Washington D.C. city government, the University of Arizona, and Gothenburg University in Sweden. Because tens of millions of consumers already use our products, it is easy for organizations — from businesses to non-profits — to adopt them. Very little training is required and the passionate Google users already in these organizations are usually excited to help those who need a hand. In many ways, Google Apps are even more powerful in a business or group than they are for individuals because Apps can change the way businesses operate and the speed at which they move. For example, with Google Apps Web Forms we innovated by addressing the key problem of distributed data collection, making it incredibly simple to collect survey data from within the enterprise — a critical feature for collecting internal feedback we use extensively when "dogfooding" all of our products. There are a number of things we could improve about these web services. For example, since they have arisen from different groups and acquisitions, there is less uniformity across them than there should be. For example, they can have different sharing models and chat capabilities. We are working to shift all of our applications to a common infrastructure. I believe we will achieve this soon, creating greater uniformity and capability across all of them. We have found the web-based service model to have significant advantages. But it also comes with its own set of challenges, primarily related to web browsers, which can be slow, unreliable, and unable to function offline. Rather than accept these shortcomings, we have sought to remedy them in a number of ways. We have contributed code and generated revenue for several existing web browsers like Mozilla Firefox, enabling them to invest more in their software. We have also developed extensions such as Google Gears, which allows a browser to function offline. We first created mobile search for Google back in 2000 and then we started to create progressively more tailored and complex mobile offerings. Today, the phone I carry in my pocket is more powerful than the desktop computer I used in 1998. It is possible that this year, more Internet-capable smartphones will ship than desktop PCs. In fact, your most "personal" computer, the one that you carry with you in your pocket, is the smartphone. Today, almost a third of all Google searches in Japan are coming from mobile devices — a leading indicator of where the rest of the world will soon be. However, mobile software development has been challenging. There are different mobile platforms, customized differently to each device and carrier combination. Furthermore, deploying mobile applications can require separate business arrangements with individual carriers and manufacturers. While the rise of app stores from Apple, Nokia, RIM, Microsoft, and others as well as the adoption of HTML 5 on mobile platforms have helped, it is still very difficult to provide a service to the largest group of network-connected people in the world. We acquired the startup Android in 2005 and set about the ambitious goal of creating a new mobile operating system that would allow open interoperation across carriers and manufacturers. Last year, after a lot of hard work, we released Android to the world. As it is open source, anyone is free to use it and modify it. We look forward to seeing how this open platform will spur greater innovation. Furthermore, Android allows for easy creation of applications which can be deployed on any Android device. To date, more than 1000 apps have been uploaded to the Android Market including Shop Savvy (which reads bar codes and then compares prices), our own Latitude, and Guitar Hero World Tour. The past decade has seen tremendous changes in computing power amplified by the continued growth of Google's data centers. It has enabled the growth and processing of increasingly large data sets such as the web, the world's books, and video. This in turn has allowed problems once considered to be in the fantasy realm of artificial intelligence to come closer to reality. Google Translate supports automatic machine translation between 1640 language pairs. This is made possible by large computer clusters and vast repositories of monolingual and multilingual texts: http://www.google.com/intl/en/help/faq_translation.html. This technology also allows us to support translated search where the query gets translated to another language and the results get translated back. While the earliest Google Voice Search ran as a crude demo in 2001, today our own speech recognition technology powers GOOG411, the voice search feature of the Google Mobile App, and Google Voice. It, too, takes advantage of large training sets and significant computing capability. Last year, PicasaWeb, our photo hosting site, released face recognition, bringing a technology that is on the cutting edge of computer science to a consumer web service. Just a few months ago we released Google Flu Trends, a service that uses our logs data (without revealing personally identifiable information) to predict flu incidence weeks ahead of estimates by the Centers for Disease Control (CDC). It is amazing how an existing data set typically used for improving search quality can be brought to bear on a seemingly unrelated issue and can help to save lives. I believe this sort of approach can do even more — going beyond monitoring to inferring potential causes and cures of disease. This is just one example of how large data sets such as search logs coupled with powerful data mining can improve the world while safe guarding privacy. Given the tremendous pace of technology, it is impossible to predict far into the future. However, I think the past decade tells us some things to expect in the next. Computers will be 100 times faster still and storage will be 100 times cheaper. Many of the problems that we call artificial intelligence today will become accepted as standard computational capabilities, including image processing, speech recognition, and natural language processing. New and amazing computational capabilities will be born that we cannot even imagine today. While about half the people in the world are online today via computers and mobile phones, the Internet will reach billions more in the coming decade. I expect that by using simple yet powerful models of computing such as web services, everyone will be more productive. These tools enable individuals, small groups, and small businesses to accomplish tasks that only large corporations could achieve before, whether it is making and releasing a movie, marketing a product, or reporting on a war. When I was a child, researching anything involved a long trip to the local library and good deal of luck that one of the books there would be about the subject of interest. I could not have imagined that today anyone would be able to research any topic in seconds. The dark clouds currently looming over the world economy are a hardship for us all, but by the time today's children grow up, this recession will be a footnote in history. Yet the technologies that we create between now and then will define their way of life. Great, but is there someone BEHIND it? "It is a reception desk, made of wood. It is partly teak with some coconut wood. On it there is a calender, a map of ------ and some brochures about tours in the local area, there is also a guest register and menus for the restaurant. Weve added a few plants and dried flowers to soften the appearance, and there are 2 blackboards where we write the special dishes of the day in both ------ and English. Today weve purchased fresh seafood off the local fisherman and are doing fried squid with chilli and basil leaves..its quite popular, kind of spicy but thats ------- food for you. On the top of the reception desk there is a sign saying 'welcome to ---------- Resort', its dark blue with cream writing.I dont think ive missed anything there." Wanna make a hoetl rooms booking in the Best Xiamen Hotel , Millennium Harbourview Hotel Xiamen ? Make hotel rooms reservation here ! Though in Xiamen, hotel career makes happy easy life for me. Never can one neglect the globe is connected , everyday there are 25,000 dying of hunger in the world. A little bit mercy at every moment will do. Xiamen hotels caring ,all the time . 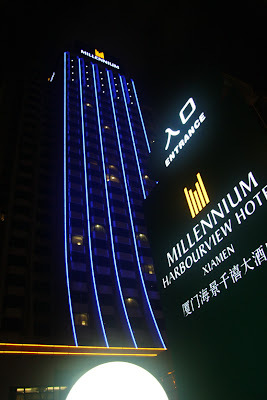 Wanna make a hotel rooms booking in the Best Xiamen Hotels , Millennium Harbourview Hotel Xiamen ? Make hotel rooms reservation here ! Harbourview Cup Golf tournament is in few days time in Xiamen , this the first Golf tournament in Xiamen Hotel history since 1997 . China Telecom is an old partner to sponse the event. Hundreds of golfers will be excited to be one of them in this moment. Charity is always the most important theme in today's life , the admission fee will be given to Red Cross for the people needy. Even in the Orient Golf course there will be small highlights for charity that will touch you. Can't wait to see , such a valuable event in Xiamen Golfers' hearts. 9th May , 6:30am , be there or be square! 2. Will arrange the Charity activities for all Par 3 hole. If the player cannot be 1-on to the putting green, player should donate RMB50 into the Donation Box. I've been asked to lecture at a Chinese high school in Xiamen about the differences between Chinese and American culture, so below, and in a few following blogs, will be some rough drafts of my thoughts so far. The longer I live in China, the more I realize that the difference between Chinese culture and American culture is—everything! From use of color to how we cook, from body language to body space, we are not just separate cultures but different planets. But fortunately, most of this is on the social level. Individually, we are very similar indeed, with the same needs, hopes, and fears as any other peoples on the planet. So I believe that the day will come when East does meet West—though it may not be in my lifetime. There are so many issues in which we differ, so for this talk I will focus on just a few that many of us would assume are universal, such as views on body space and privacy, importance of family and patriotism, value of education and view of teachers, use of time and history, use of color, cooking and dining, and a little about Chinese and American humor. Of course, I may not be the right one to write this. My wife Susan Marie says I have no culture whatsoever. She’s probably right—but at least I have class. In fact, I have 12 hours of class a week in the MBA Program. Personally, I never expected to have so many classes in a classless society. Chinese seem to live for food, and spend much of their day preparing or eating dishes that are a feast for both palate and eyes—and things I never could have imagined people would eat. I eventually learned that Chinese eat anything edible, and if it isn’t edible, they call it medicine and ingest it anyway. In N.W. Fujian they boast about noodles made from the flour of a very poisonous tuber. “Takes 18 steps to make it safe,” my host told me. I asked him how many people died on steps 1 to 17. And birds nests! Just who thought of crawling up the side of a cliff into a cave to steal bird’s nest made of solidified swallow spit—and then cooking it? And in China I think I’ve eaten every part of a chicken, cow or pig except the meat itself. Chinese will fuss over a tiny morsel of meat that’s smaller than some of the bits I fish out of my mouth with a toothpick after the meal. If they do give you meat, it’s chopped up small—and chock full of sharp little bones. Personally, I think it’s all a front, carried out on a national level, and after foreign guests leave the Chinese break out the steaks. The hardest thing to get used to is how long Chinese take to eat. At one of our first three-hour 20-course meals in China, my oldest son, who was only five, said, “This is certainly not fast food—it’s slow food.” For Chinese, meals are a social event. For Americans, meals are a pitstop for refueling. Quite often, we just swallow our meal whole and then chew it later. May 1st , in Xiamen , if you are lucky enough , you may go to the Xiamen Philharmonic Concert Hall to enjoy a classic meal , conductor Fu Rechang is touching the audience' heart from every note giving out from the stage . The program are Prokofiev's Symphony No.1Classical and Schostakovich's Symphony No.7. From these days , Xiamen's classic music fans are getting more and more , people are more interested in sofisticated joy and ease. Fu Rechang was just great to make the day for everyone in the concert , a really meaningful holiday. Since the May 1st golden week has been cancelled , there should be no expectation for the Labour day vacation . Surprising to me , the travellers to Xiamen were arising , the Xiamen hotels are busy with the intruders. 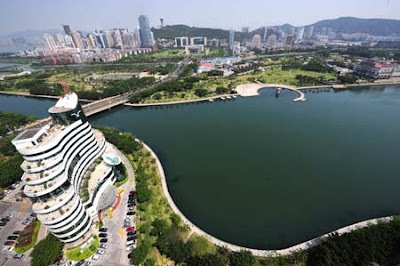 Obviously , Xiamen has been marked as one of the most beautiful cities for residence in China , and people love to return and return , just like a second home even the Swine Flu could not restrict .